Khenpo Karthar Rinpoche arrived in the United States just after the arrivals of Lama Ganga, another Kagyu teacher who also received his early training at Thrangu Monastery, and Yeshe Namdag, who fled Tibet with the Sixteenth Karmapa and served as his personal attendant at Rumtek. These three joined Tenzin Chonyi, who had been asked by the Karmapa to stay in America as his representative after his first world tour in 1974. 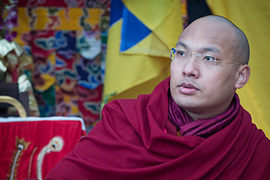 Together, this group was charged by His Holiness with the task of establishing and building a monastery to serve as the seat of the Karmapa in North America. 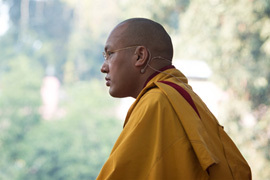 The group moved into a house which sat at the edge of 375 rustic acres of land in Putnam County, New York, that had been generously offered to the Karmapa by C.T. Shen, one of the great patrons of Buddhism in America. Khenpo Rinpoche began travelling to New York City on a weekly basis to offer teachings at a fledgling center that soon became the New York City Karma Thegsum Choling (KTC). 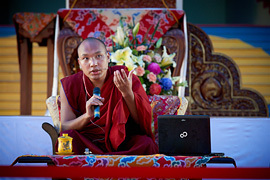 In the wake of the Karmapa's second United States tour in 1977, more KTC centers were established in Palo Alto and Santa Cruz, California; Columbus, Ohio; and shortly thereafter in Albany, New York; and Cambridge, Massachusetts. 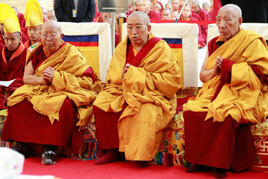 Meanwhile, the search was on for a permanent site to establish His Holiness' North American headquarters. 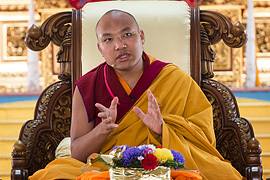 While visiting the Putnam County property in the spring of 1977 during his second world tour, the Karmapa told Khenpo Karthar Rinpoche that he should open the new dharma center on the auspicious day of Saga Dawa in the following year (May 25, 1978). It was becoming apparent that the donated land, although a fine piece of property with much natural beauty, was unsuitable even for building an access road. Through fortuitous circumstances, a mountain-top property nestled above the town of Woodstock was found, and in early 1978, the Mead House was purchased to become the home of Karma Triyana Dharmachakra. 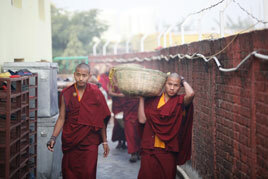 Khenpo Rinpoche and the others, now joined by Bardor Tulku Rinpoche, soon moved in and began cleaning up the property. A formal shrine room was created on the ground floor of the 113-year-old house for public teachings and empowerments. 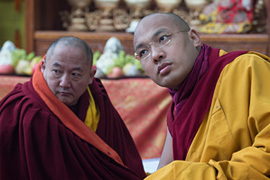 Soon, it was May 25, and just as the Karmapa had predicted, Karma Triyana Dharmachakra opened in a new home as his North American seat, with Khenpo Karthar Rinpoche as its abbot. 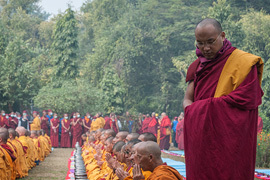 During the first several years after KTD was established, Khenpo Karthar Rinpoche continued to oversee and travel to a growing number of affiliate centers around the country. By the early 1980s, centers had been founded in Chicago, Ann Arbor, Santa Fe, Los Angeles, San Diego, Santa Barbara, Seattle, and Chapel Hill (North Carolina), to name a few. In 1982, Khenpo Rinpoche embarked on a three-week tour of South America, visiting Columbia and Venezuela where he established two more KTCs. Rinpoche continued to make annual trips for a number of years offering refuge and bestowing teachings to a growing South American sangha. 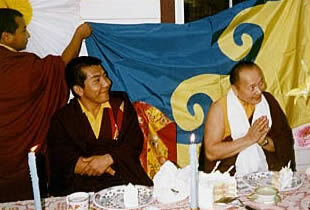 In late 1985, Khenpo Karthar once again accompanied Thrangu Rinpoche on a teaching tour as he had done in their early years in Tibet, but this time they visited centers throughout the United States. By the mid-1980s, there were thirty-two affiliate centers in North and South America, and three in Taiwan. 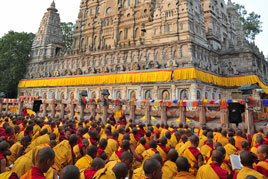 Khenpo Karthar Rinpoche was now travelling to teach at all of them on an annual or semi-annual basis. 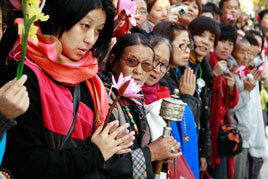 The centers in Taiwan were particularly enthusiastic to receive teachings and empowerments from Rinpoche. 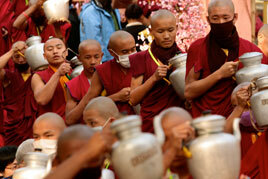 Since the early 1980s, he has made at least ten trips to the Far East, including some with Thrangu Rinpoche. During recent trips he has visited a dozen Karma Kagyu centers in Taiwan alone, including those in Yilan, Kaoshiung, Chiayi, Tainan, Changhua, and Tapei. With a solid base in Woodstock and a busy travel schedule, Khenpo Rinpoche initiated a tradition of longer, more intensive teachings at KTD. During the summer of 1981, he offered two month-long courses: one on the Amitabha sadhana and the other on the Mahayana Uttara Tantra Shastra (The Changeless Nature). In the summer of 1983, Rinpoche taught a three-month course on "Ground, Path and Fruition," and in 1984 taught a series of courses on "View, Meditation, and Action" from late May through mid-September, with a month-long course on the Medicine Buddha in-between. By 1989, Khenpo Rinpoche began to scale back the length of his annual summer teachings to better accommodate the growing number of students coming from farther away. 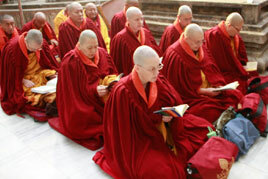 Thus, the tradition of the ten-day teaching began with "The Profound Inner Meaning" during the first two summers, followed in 1991 by "The Guru Yoga of Marpa." 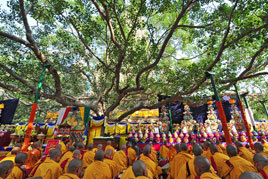 The ten-day teaching continues annually at the time of the July Fourth holiday, often coinciding with the anniversary of Buddha Shakyamuni's first turning of the wheel of dharma, one of the four great occasions in the Buddhist calendar. Throughout the 1980s, Khenpo Karthar was not only teaching, but also fully involved in overseeing the building of the new monastery. In addition to consulting on the construction, furnishing, decoration, and architectural geomancy, he was involved in every aspect from helping mix cement to fabricating the meditation cushions for the shrine rooms, sewing the brocade frames around the lineage thangkas, and overseeing the consecration of many of the rupas. 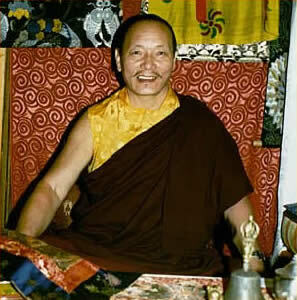 In 1980, the Sixteenth Karmapa had visited Crestone, Colorado and accepted a gift of two-hundred acres of natural land in the Sangre de Cristo mountain range. 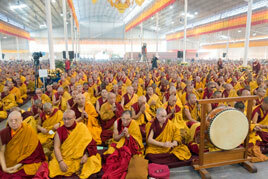 His Holiness wished to see this site become a place where the dharma and Tibetan culture could be preserved. His Eminence Jamgon Kongtrul Rinpoche visited the Crestone site in 1988 and encouraged the sangha to first build a stupa before any other buildings were constructed. In the autumn of 1989, Khenpo Karthar travelled to Colorado to select an auspicious site and bless the land on which the Tashi Gomang Stupa would be built. The following year, he returned to Crestone with Bardor Tulku Rinpoche to formally consecrate the site of the stupa so construction could begin. Over the next seven years a devoted group of individuals living in the area worked tirelessly to raise funds and build the traditional forty-foot-tall stupa. Khenpo Karthar Rinpoche and Bardor Tulku Rinpoche supervised all aspects of the construction from their base in Woodstock, with occasional visits to the site. Finally, in July of 1996, the two Rinpoches were joined by Bokar Rinpoche (who officiated) and other Rinpoches and lamas for the formal consecration of the completed stupa. Initially, the property in Colorado was seen as a prime location to build a traditional three-year, three-month Karma Kagyu retreat center. A key element of this plan was that Lama Ganga would serve as drupon (retreat master), but when he died in 1988 during a trip to Tibet, Khenpo Karthar Rinpoche knew this role would fall to him. Since arriving in the United States, Khenpo Karthar had led individuals in solitary retreat--one as long as twelve years--and two small cabins on the KTD property met this need. 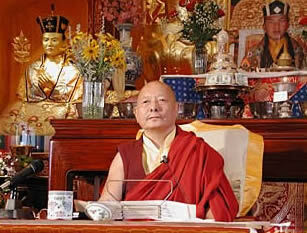 But with a growing number of students wishing to do the traditional three-year retreat, a facility was needed that was close enough to KTD to enable Rinpoche to serve as its drupon and maintain his teaching schedule at KTD and the KTCs. Clearly, Colorado would be too far away for such a retreat center. Auspiciously, in 1989, an anonymous contributor donated 40 acres of land in Delaware County, New York, an eighty-minute drive from KTD. It was a perfect site for establishing the retreat facility. In 1990, Jamgon Kongtrul Rinpoche blessed the land and soon thereafter an access road was built on the property. Before the freezing winter weather set in, Khenpo Karthar and Bardor Tulku Rinpoche were able to bless the excavation of the first building of the Karme Ling Retreat Center before its foundation was poured. Once again, under the direct supervision of Khenpo Karthar Rinpoche, another facility for the practice of dharma envisioned by His Holiness Karmapa came to fruition. Rinpoche oversaw the construction of two retreat buildings (one for women and one for men), an ani house for nuns to live and practice, and a lama house to accommodate visiting Rinpoches and individual short-term retreats. He saw to the assembling of all the interior details of these buildings, personally collecting an outstanding number of thangkas and rupas to adorn each shrine room. 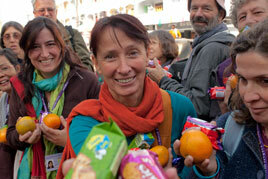 The first retreat at Karme Ling began on January 23, 1993, followed by a second in November 1996. 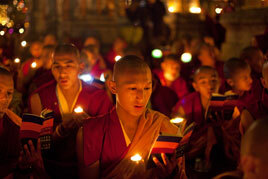 The third retreat began on the auspicious day of Lhabab Duchen in late 2000. 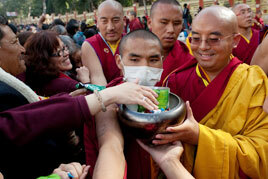 Almost thirty years after he originally fled his homeland, Khenpo Rinpoche was fortunate enough to return to Tibet. In 1988 he travelled to Thrangu Monastery in Kham where he was reunited for the first time with many relatives and old friends. 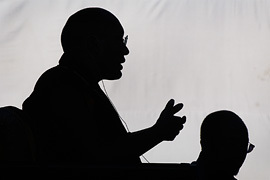 While there, he was able to impart the instructions he received in his youth for the rainy-season retreat practices (yarney) to a new generation of monks, and then officiate at the month-long retreat. 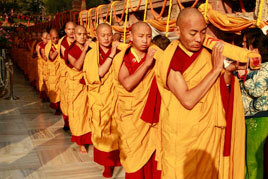 He has returned to Kham three times since his first visit, most recently accompanying Thrangu Rinpoche. 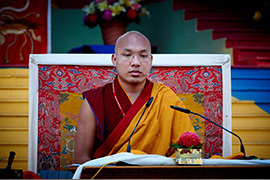 Khenpo Karthar Rinpoche has strong family ties to Thrangu Monastery, since his nephew, the fifth Tulku Lodro Nyima, is the only one of four primary Rinpoches associated with Thrangu Monastery to live there and oversee its current operations. Rinpoche made a third trip to Tibet in 1992, shortly after the enthronement of His Holiness the Seventeenth Karmapa, Ogyen Trinley Dorje at Tsurphu Monastery. In front of the sacred Jowo Shakyamuni at the Jokhang Temple in Lhasa, Khenpo Karthar participated in the formal ordination and hair-cutting ceremony of His Holiness led by their Eminences Tai Situ Rinpoche and Goshir Gyaltsap Rinpoche. It was an auspicious time for Khenpo Karthar Rinpoche to reunite with His Holiness the Gyalwa Karmapa. After more than forty years of spreading and teaching the dharma outside Tibet, Khenpo Karthar Rinpoche has a prolific body of work published in English and Chinese. Dozens of his teachings given over the past thirty years at KTD and some of the KTCs have been published in Densal magazine and as transcripts by KTD's Namse Bangdzo Bookstore. In 1992 his book Dharma Paths, an in-depth introduction to the Tibetan Buddhist path, was published by Snow Lion Publications, and in 1996, Snow Lion published Rinpoche's commentary on The Precious Garland of the Supreme Path by Je Gampopa with the title The Instructions of Gampopa. The English versions of Rinpoche's published works are available through Namse Bangdzo Bookstore. Chinese translations of Rinpoche's work, published in Taiwan, include Dharma Paths, The Profound Inner Meaning, The Four Dharmas of Gampopa, The Ocean of Definitive Meaning, Enlightened Women, and the Collected Teachings of Khenpo Karthar Rinpoche. Many of these have become top-selling dharma publications in Taiwan. Forthcoming is a Chinese translation of the collected teachings of Gampopa. 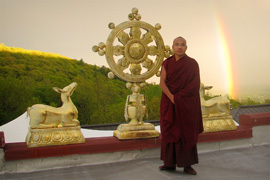 As the abbot of Karma Triyana Dharmachakra, Rinpoche has been responsible for insuring that preparations are in keeping with age-old Tibetan traditions when visiting Rinpoches and lamas teach at KTD. Distinguished visitors include His Holiness the Sixteenth Karmapa, His Holiness Sakya Trizin, all the regents of the Karma Kagyu lineage, and numerous eminent Tibetan teachers. 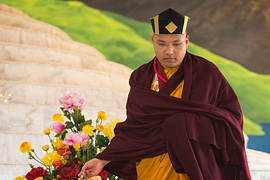 For over three decades Khenpo Karthar Rinpoche has patiently guided a great variety of Western students unaccustomed to the ways of these Himalayan traditions. He has imparted these traditions in a way that maintains great respect for the oral tradition of the Karma Kagyu practice lineage. 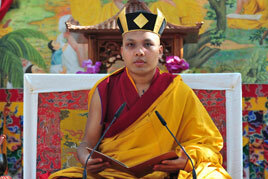 Khenpo Karthar Rinpoche is now preparing for a most important visitor to KTD, His Holiness the Seventeenth Karmapa. When Ogyen Trinley Dorje comes, he will see first-hand some of the work done on his behalf to fulfill his vision for the dharma to spread throughout the world for the benefit of all sentient beings. This has been accomplished in no small part due to the teaching, building, writing, counseling, sewing, and tireless efforts of one devoted student: Khenpo Karthar Rinpoche. The "Early Years" through the "Resettlement" sections of this biography were edited from Eleanor Mannikka's "Biography of Khenpo Karthar Rinpoche," published in Densal magazine. The rest of the biography was written by Tim Wolf. Part I of Khenpo Karthar Rinpoche's biography includes information on his early years and training, and his flight from Tibet and resettlement.